Goat walking is the old-fashioned way of turning your goats out to graze. This is the method that people have used for thousands of years. 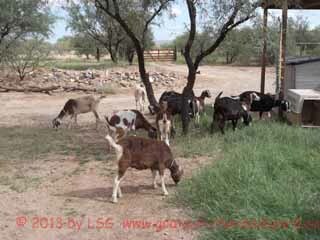 It consists of you, at least one goat (or as many as you want), and an open space where they can graze or browse brush. This can be done with the goat on a leash (which makes it "taking a goat for a walk," like you would a dog) or can be done with the goat loose, just following along as you go for a stroll. This is what a goat herder does and it is an easy, pleasant, and amazing thing to experience. The point of taking your goats out goat walking is the brush-eating they will do while walking, not the walking itself. 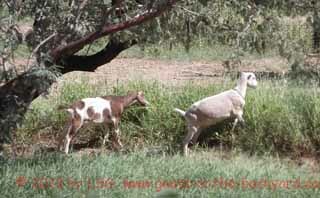 You want to "wander" more than walk in order for the goats to spend most of their time out nibbling on plants. You can direct where they go by being out goat walking with them -- you just "mosey" toward where you want them to browse. Going goat walking is a cool experience. Just you, some goats munching on vegetation, and nature. Keeping the goats with you is very easy -- that is what goats (usually) do. If you are their regular goat-keeper, handle and work around them on a daily basis, they will see you as the "leader" of the herd. Most goats, most of the time, will follow their 'leader' wherever he or she goes. You use 'goat psychology' to your advantage. Goat walking means that you (or some other human, your kids perhaps) are out with the goats. You can go walking with them while your goats munch on weeds, grass, and brush just because you enjoy being outside, or because you enjoy being with the goats, or both. 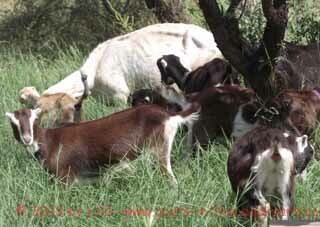 But going out with the goats is also a technique for using your goats to graze down brush in places you don't want them to be by themselves, without the need or bother of tethering or staking them out (which also requires your supervision). This can be on your property, in your 'backyard,' or out anywhere there are no fences to keep your goats contained while they graze. I like to let my goats "free-range" in my front yard which is about an acre big, fully fenced, and has nothing in it that can hurt the goats or that the goats themselves can hurt. I don't worry about them there, I just check on them every once in a while to make sure they are okay. Sometimes, though, I let my goats in around the stack of hay in my hay yard in order to clean up the fines (small bits of hay) that naturally fall to the ground. I don't want the goats to eat the hay in the stack, however, or chew on the tarp over the hay, so I stand there to supervise them while they clean up loose hay. Or, there are times I want to cut down the grass around my lumber pile, wood shed, or someplace else that would be a pain for me to trim, but the goats will 'mow' down quickly. I don't leave them alone there because I don't want them climbing the lumber pile (and risk one breaking a leg) or chewing on the wood. 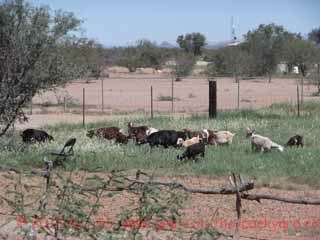 Most of the time when I take my goats out goat walking, though, I have them out where there are no fences, but I still have brush I need cut. This is usually the ditch along the front of the property, and the surrounding grass patches and thickets along the outside of my fences. I want to keep the brush cut in these areas to keep down wildlife (say rattlesnakes!) and to decrease the danger to the house and animal shelters due to wildfire. I take a hat, some sunscreen, and my trusty long-handled shovel (for killing rattlesnakes!) and lead the goats around to where I want them to graze. My presence keeps them in the area. If they wander too far, I call them back. If I want more grazing somewhere I move toward that area and the goats will go there, too. When I'm ready (I figure an hour before they are bored, thirsty, and full -- or I'm bored, thirsty, and hungry) I lead them back to their pen to get a drink, a lick of salt, and to chew their cud. Goat walking is not difficult. If you are the one who handles, works around, and feeds your goats every day, they see you as the "leader" of the herd. If your goats crowd around your feet and follow you wherever you go in the pen, you know you've been promoted to 'top goat' status! You just use that power to 'lead' your goats wherever you want them to go, then stand where you want them to browse. If you train your goats to come when you call (I use the call, "Here, goat. Heeere, goat") while you feed them, they will come to you when you call them while out goat walking. 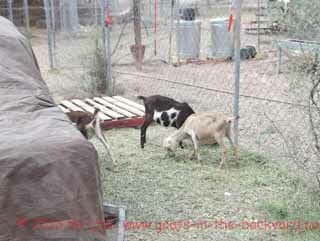 If you feed your goats grain, or any pelleted feed, use that to train your goats to come when you call also. Take a small bucket, or a metal coffee can, put a handful of grain in it and shake it (make it rattle) while you feed and call them. If you do that every day when you feed, the goats will quickly learn they will get some grain when they hear that sound. Take the can with you while goat walking. When you want them to come in, rattle the can and call them, then head for their pen. Make sure to give them some grain when they are in, or next time this won't work! You should also take a "staff" with you. The traditional shepherd's crook is the best. They are still made and you can find them in sheep supply catalogs. Shepherd's cooks are used as a walking stick, to help you stay on your feet walking on uneven ground; to poke or prod a goat, either to move or to break up little goat fights; and to hook around the neck of a goat to pull her out of a thicket (or out of a little goat fight!). If you can't find a staff, any sort of walking stick you are comfortable with will work, even if it doesn't have the 'crook' on the end (the hook). As I said above, I carry a long-handled shovel when I go goat walking. I use it as a walking stick, to kill rattlesnakes, to fill in holes, and to occasionally prod an uncooperative goat. It doesn't work as a hook, but I keep collars on my goats and can grab them by hand if I need to move them around. There is a different way of goat walking and it is "taking a goat for a walk." This is where you have the goat on a leash, like a dog, and take it for a walk with you. The point of this would (more than likely) be to attract attention. The only people I have ever met who take their goats for a walk, do it only for that reason (whether they admit to it or not). A person who has pet goats and takes them out in a neighborhood, on leashes, for a walk, is trying to get other people to notice them, think they are weird, or get other people to stop and talk to them. I don't think these kinds of people are weird. I think they are pathetic. People who use goats (or children, or sports cars, or anything else) to meet people and make 'friends' are shallow, narcissistic ghosts of human beings. Someone who does this will, at some point, lose interest in their 'people bait' and cast it aside. Casting aside a car, or clothes, or a hobby is fine, but when it is a living thing (child, dog, goat, spouse) it is NOT fine. You have an obligation to the living thing you have taken into your care, ESPECIALLY if you have bred that thing into existence, such as an animal, or your own children, and you should not treat them as if they are there for your amusement or convenience. If this is the reason you have (or want) goats, get the goats a good home and then -- go get a life. Some people, however, may have to go goat walking to take the goats out grazing with the goats on leashes. Due to traffic, lack of open space, squirrely goats (goats acting squirrely? Nah, doesn't happen. HA! ), or any number of other reasons. I have never had a reason to do this, nor have I ever met anyone who did, but I can (sort of) see the possibility. Take the Queen of the herd (or the lead buck) and put just that goat on a leash. Some goats will take off and leave the human in the dirt, but will not leave the leader of the herd. Take that goat for a walk, and the two of you take the others out goat walking. Good point, and I stand corrected. Thank you, Sue. 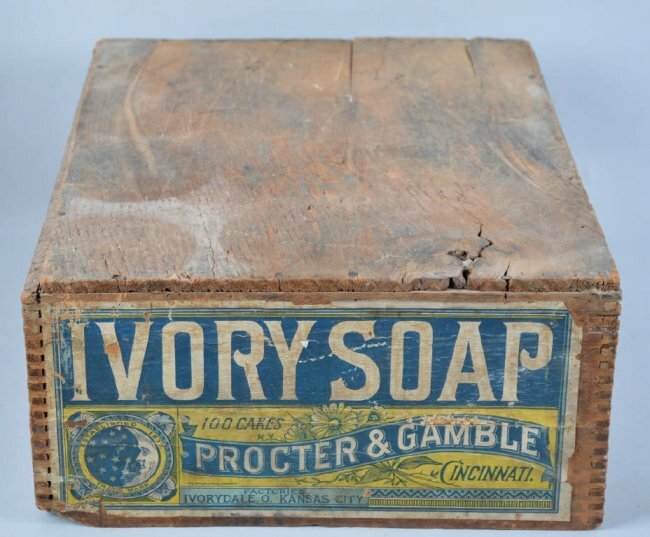 OK, Off My Soapbox, How Do You Do It? So, if you decide you want to take your goat(s) for a walk on a leash, here's the best method. First, read my article about training your goat to tie. Why? Because a goat that can stand tied (meaning 'give in' to the control of the leash) will be much more pleasant to take for a walk. To walk on a leash, your goat needs a sturdy, buckle-type collar that has been fitted to his neck. For most goats that means it is loose enough that you can get two or three fingers under the buckled collar, between the collar and the goat's neck. EXCEPT if your goat is a LaMancha ("without ears"), then you want to buckle the collar flat against his neck, just loose enough the goat can still swallow, but no looser. You also need a strong leash, preferably a 5/8-inch wide, 6-foot long cotton or nylon dog leash, with a swivel snap on the end. If you have read my suggestions for training to tie a goat, or my ideas about tethering and staking out goats, you have heard me describe making a 'noose' out of the leash for tying the goat. Just clip the leash to the ring on the goat's collar and carry or hold the leash like you would for a dog. No goat is going to "walk at heel" like a trained dog will. The goat is going to go for a walk (hopefully) and you're going to just try to keep up. The leash is to keep the goat from getting away from you and running loose in the neighborhood. You can also use it to coax a reluctant goat to keep up with you, if your goat is not sure about this "going for a walk" thing.